NEW YORK (CNS) — Volunteering at a homeless shelter, serving an unpaid internship and saving his city are all in the day’s work for Peter Parker (voice of Yuri Lowenthal) in “Spider-Man” (Sony Interactive Entertainment). As they control the iconic figure, players experience his efforts to balance his duties as an adult with his responsibilities as a superhero. 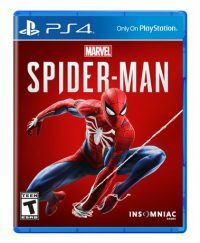 The gamer also gets to witness Parker’s personal troubles, from his crumbled relationship with ex-girlfriend Mary Jane Watson (voice of Laura Bailey) to his financial struggles just trying to pay his bills. Despite being a beloved crime fighter, Parker still has a lot of growing up to do, and players are immersed in these unfolding dramas. The game tells a fresh story about Parker, a young research assistant who was bitten by a radioactive spider and is presently eight years into his empowered state. As Spider-Man, he chases and defeats classic opponents such as Shocker (voice of Dave B. Mitchell), Rhino (voice of Fred Tatasciore) and Screwball (voice of Stephanie Lemelin) — as well as others. His work, it seems, is never done, and New York City is perpetually in peril. Spider-Man is aided in his web-slinging adventures by no-nonsense NYPD Capt. Yuri Watanabe (voice of Tara Platt). Watanabe assists the player through a tutorial mission aimed at capturing Wilson Fisk (voice of Travis Willingham), the Kingpin, before the main story line of the game launches. After Fisk’s imprisoning, supernaturally powered, demonic-mask-wearing soldiers called the Inner Demons begin to confiscate the crime lord’s abandoned assets, seeking a substance called Devil’s Breath. This drug was meant to cure diseases such as Huntington’s, but instead, fatally attacks the body’s entire immune system. The Demons follow the directives of Martin Li, aka Mr. Negative (voice of Stephen Oyoung) — whose very touch can possess the will of anyone he chooses — in seeking out this bioweapon. The Inner Demons take their name from the opera masks representing “oni,” a type of fiend from Chinese folklore, that they wear to hide their identities. Their malevolent personalities speak to why they call themselves Demons. But parents of young gamers can be assured there are no other occult meanings and nothing appealing in the depiction of these characters. While Mr. Negative has several abilities, the main one is his power to bring others under his mind control, disabling their wills. In one instance, he orders a scientist under his sway to commit suicide. From a Catholic perspective, Mr. Negative’s capability can be likened to the experience of demonic possession during which free will is compromised or lost entirely, rendering the victim guiltless for any immoral actions he or she may commit. Besides the primary mission of taking down Mr. Negative and his Demons, there are plenty of side quests and fetch missions to keep players occupied — from photographing landmarks to swinging in and stopping burglaries and assaults. Moving through the city is smooth and acrobatic, and re-enacting Spider-Man’s classic web slinging downtown is enthralling. But be warned: Ignoring the plight of the victimized denizens of Gotham will have you featured on J. Jonah Jameson’s talk show. Jameson (voice of Darin De Paul) delights in pointing out how terrible Spider-Man is for the city. Easter eggs — callbacks to other aspects of the Marvel universe — abound throughout this beautifully crafted version of Manhattan, from Avengers Tower to the offices of Nelson & Murdock, Attorneys at Law — the legal firm of Catholic superhero Daredevil. Naturally, there’s also a cameo by the late, beloved Stan Lee. Violence within the game is minimal, as Spider-Man doesn’t kill his enemies, using melee attacks and gadgets instead to capture and hold his adversaries until New York’s finest can take them into custody. If the player fails in a mission, it may involve a hostage death, but this takes place off screen. Overall, the game proves itself a solid choice for new and veteran fans alike, with plenty of content to keep players happily engaged. The game contains fleeting graphic violence, stylized combat, a suicide, occasional mild oaths and drug references. The Catholic News Service classification is A-II — adults and adolescents. The Entertainment Software Rating Board rating is T — Teen.